Rolling ladders are a common piece of equipment found in warehouses and industrial facilities and are used to help in maintenance, order picking, and other activities. Although ladders are sometimes viewed as being somewhat standard without much variation, there are a lot of factors that can affect the type of industrial ladder that will be best for you. Below are a few of the considerations that must be made when choosing a ladder. Limitations on ladder dimensions by doorways, overhead obstructions, etc. Since many different pieces of information need to be considered when choosing your rolling ladder, many different types of products and variations of those products exist. 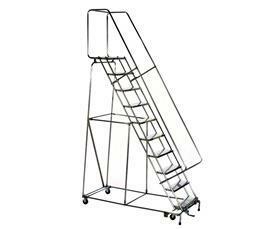 Some of the types of rolling ladders and lifts that the S. W. Betz Company carries are listed below. All ladders have various dimensions, capacities, and add-ons. Power Stocker Lift – Ideal for applications where product/material is too heavy or bulky to be safely handled on an industrial ladder. Tank Top Lifts – Provides easy access to tank trucks, railroad cars, or other cantilevered applications. Mini Scissor Lift – To lift employees/personnel. Ideal for maintenance and order picking. Order Picker Maintenance Lift – Designed for assistance with order picking applications. In addition to many of the standard rolling ladders and lifts that we carry, the S. W. Betz Company also offers customizable solutions to meet any lifting need you might have. If you have a customizable application, contact one of our team members, and we will be happy to assist you. The S. W. Betz Company has been distributing rolling ladders for over 80 years and has developed relationships with many of the top manufacturers in the industry. We are a preferred distributor in Maryland and the Mid-Atlantic region for Ballymore, a manufacturer of safety and industrial ladders and lifting products. Ballymore is located in Parkersburg, Pennsylvania and has been a top manufacturer since 1945. If you are in need of or would like more information on any of our rolling ladders, please contact us and one of our team members will be happy to assist you. For more information about Rolling Ladders or any other product or service from S.W. Betz, fill out and submit the form to the right.